An event specifically for business and industry to find out about the University’s Department of Chemistry research, facilities and collaborative opportunities is taking place on campus today. The Industry-Chemistry Engagement Meeting (I-ChEM) is a two day event that will showcase a number of research areas where Liverpool has particular expertise and facilities which industry can access. These areas include: energy storage and catalysis; functional interfaces; materials chemistry; theoretical and computational chemistry; and medicinal and bio nano medicinal chemistry. The Department of Chemistry was ranked 2nd in the country in the most recent assessment of its research and has a well-established track record of working with industry to provide technological solutions and develop new products. Recent examples include providing catalysis expertise to develop a green and low cost manufacturing process and delivering low toxicity, cost efficient class of antifouling materials to reduce CO2 emissions for the maritime sector. The University’s Chemistry Department boasts a number of unique, world-leading facilities that industry can access alongside accompanying technical support. In particular delegates will have an opportunity to visit and to explore potential engagement routes with the Materials Innovation Factory. This recent development houses one of the highest-concentration of materials science automation robotics in the world and has world-leading expertise in automated materials discovery. The amalgamation of world leading research and unique automation facilities means that University chemists are at the forefront of the discovery and development of a new generation of advanced and functional materials and that the research and development process can be accelerated by a factor of 200. The University’s Stephenson Institute for Renewable Energy is a leading UK centre for developing clean and sustainable energy technologies. It has a specific focus on energy dissipation and friction, wind and marine energy, fusion technology, photovoltaics, carbon capture and storage, sustainable feedstocks, batteries, fuel cells, hydrogen generation and storage, solar harvesting, energy transport. The Open Innovation Hub for Antimicrobial Surfaces develops and share knowledge and innovation in the science of antimicrobial surfaces. It brings together the expertise, ideas, and resources of industry, the NHS, academia to create rapid innovation pipelines by developing connections and forging partnerships. 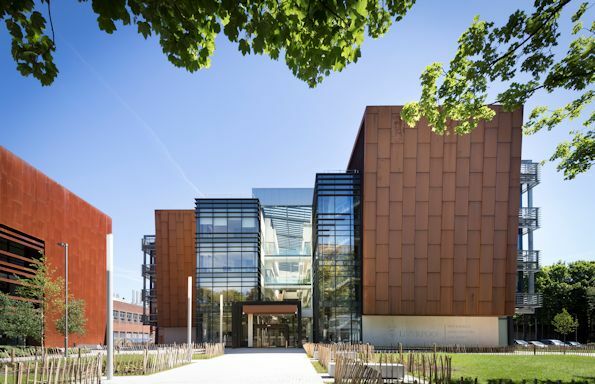 The Surface Science Research Centre cuts across the disciplines of chemistry, physics, biology and materials science, and combine the efforts of both experimentalists and theoreticians. The overarching ambition of this work is to achieve nanoscale control, design and assembly of function. The Industry-Chemistry Engagement Meeting (I-ChEM) takes place on 13th and 14th of September in the Brett Building on the University Campus.